and what an expensive price it was. perished. 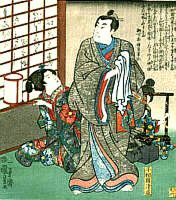 Click here for Kiyomori's concubine. according to a 19th century painter. Serves me for an inn. There is but a wayside flower. So they knew it couldn't be anybody else but Taira Tadanori. His entire family were artists. Taira Akira (Tomoakira) doing his last dance before Minamoto Yoshitsune killed him. That same day of Tomoakira's death, the Minamoto clan had killed Taira Michimori and his younger brother Narimori, Taira Tadanori (see the pic at your left), Taira Moromori, Taira Kiyosada, Taira Kiyofusa, and the well-known brothers, sons of Taira Tsunemori: Tsunemasa, Tsunetoshi, and Atsumori (click here for this one). These young men also happened to be Taira Tadanori's grandsons. Taira Tsunemasa was a great stringwhanger (on the traditional Japanese 'biwa'); his teenage brother Atsumori was a flutist. Minamoto clansmen would have recognized this family even if they didn't have any crest on their clothes or banners on their backs; just like the soldiers that identified Taira Tadanori through his poem, the slayer of Taira Atsumori did so via his flute. The instrument was called 'Saeda' ('Little Twig'). Somehow everybody knew this. Click here for history and pictures of Japanese clothes since the year 660, and see the differences of each era's official dresses.